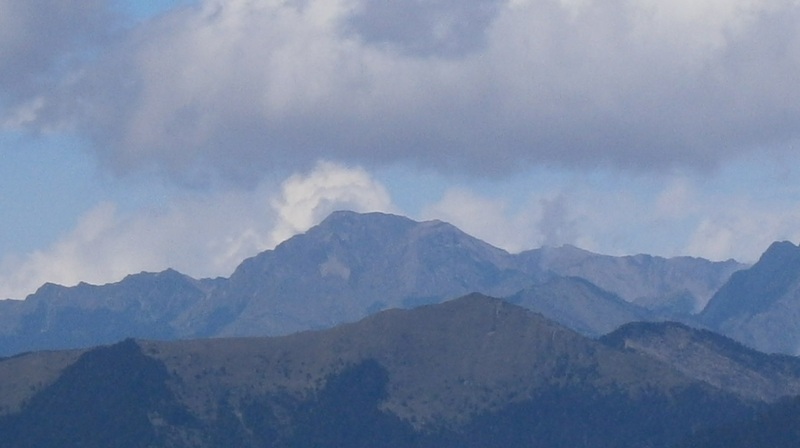 Nanhuda Shan (left) and Zhongyangjian Shan (right) viewed from North Hehuan Shan. Nanhuda Shan, Taiwan’s fifth highest at 3742m, is one the most beloved mountains among Taiwanese hikers and is famous for its views and impressive, rocky faces. 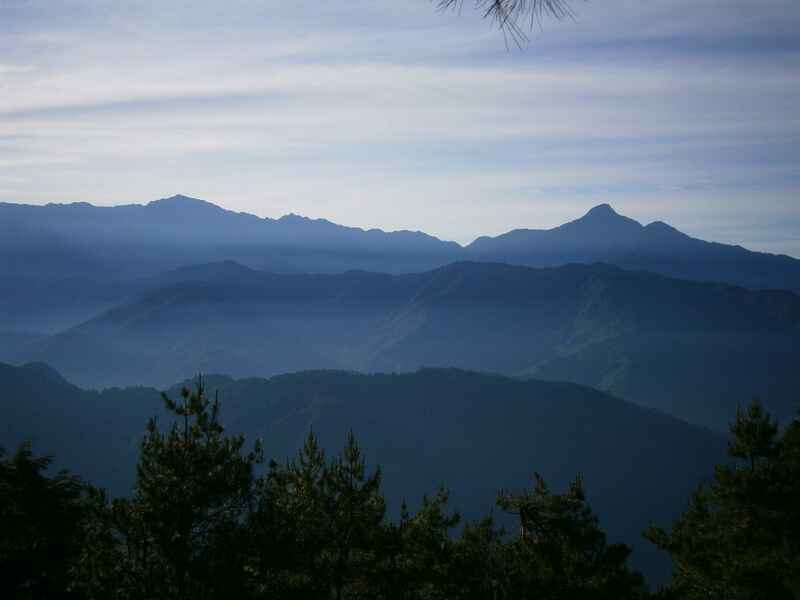 Many experienced Taiwanese hikers will tell you that Nanhuda Shan is the most scenic, the most beautiful of Taiwan’s mountains. I visited Nanhuda Shan in early February, and unfortunately experienced absolutely terrible weather on all four days of my trip. Walking the entry road near the trailhead on the first day, before the weather turned to soup. Despite the awful weather, the hiking was exceptional. The route initially heads up through forest, but breaks the treeline after the first day, leading one across an awesome landscape of barren rock. In the snow higher up, it was an eerie and severe place. My four day hiking itinerary. Day 0: Caught a train from Taipei to Luodong, in Yilan county, and stayed overnight in an inexpensive hotel. 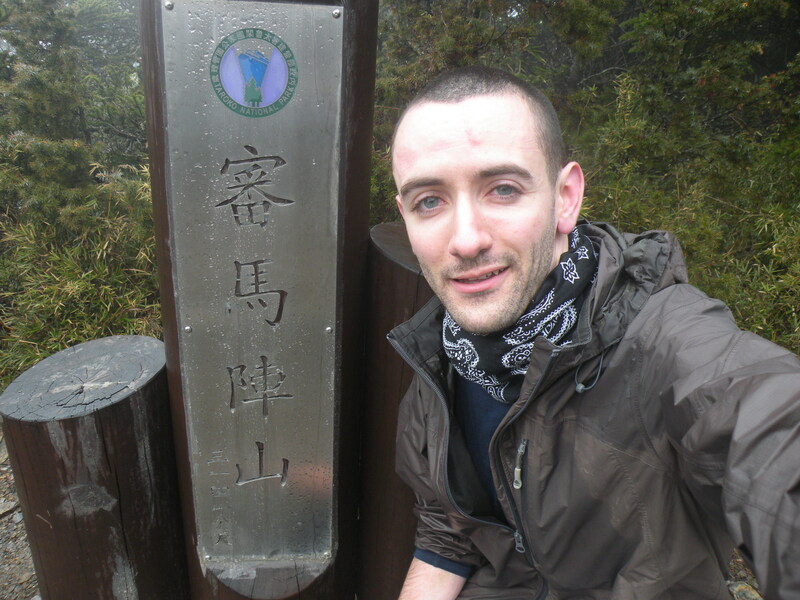 Day 1: Up early, caught a taxi (NT$2500) from Luodong to the trailhead. We opted to shell out for a Taxi, rather than rent a much cheaper motorbike, due to the already very unpleasant weather. Rain showers and thick fog on the drive up. From the trailhead, we walked 6.7km along an old overgrown service road, long rendered impassable to vehicles due to earthquakes, landslides, and typhoon damage. Not so much a road as a wide, level hiking path. Several detours took us off of the road, and over sections wiped out by landslide. The weather began to worsen, and fog descended over everything. It began to rain again. The ‘road’ is overgrown and rough. Mostly level, we covered the 6.7km at a fast pace. From the “true” trailhead, we hiked another couple of hours to the Yunling cabin, where we would camp for the first night. The Yunling cabin has plenty of bedspace and is well constructed, but we had opted to use our tents. The weather was wet and wretched, and as night fell it became quite cold. The temperature hovered around 0C; not quite cold enough for snow, and very unpleasant in the constant drizzle. I had a good night’s sleep, but the friend who accompanied me this far was feeling ill, and didn’t sleep well. 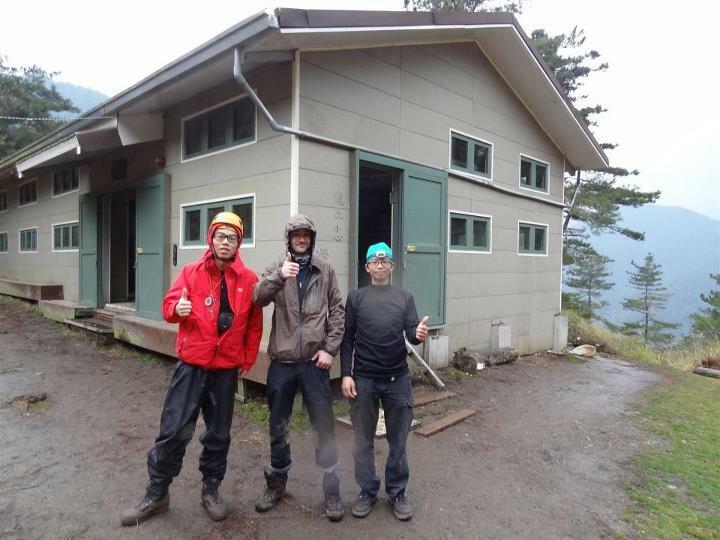 Yunling cabin, with two friendly hikers whom I met on the third day. We’re all wet! Day 2: In the morning, my friend was much worse; he had stomach pain, and could not keep food down. After much discussion, he decided to accompany another team who was headed home, and get off of the mountain. The team he went with conveniently lived in Taipei, nearby his house. They gave him a lift all the way home! I continued alone. From Yunling cabin, I hiked upwards towards the Nanhu Cabin/campsite, passing Shenmazhen Shan and Nanhubei Shan on the way. Shenmazhen Shan. Wet from the drizzle. Nanhubei Shan. Terrible visibility and heavy rain. 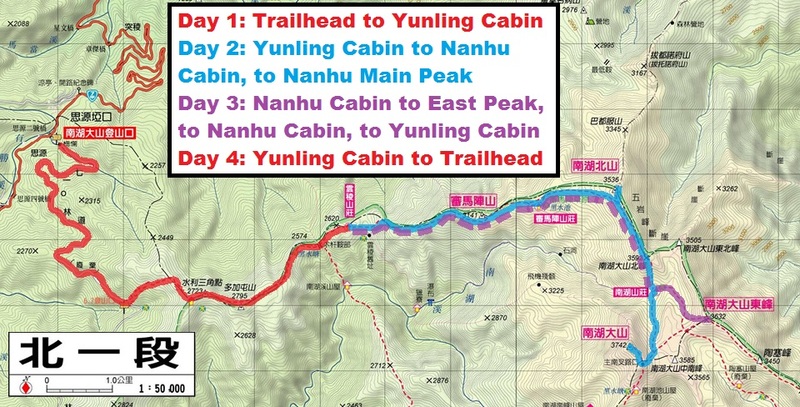 Finally reaching the Nanhu Cabin, I pitched camp nearby. The weather was even worse up high. Colder, but just as wet. 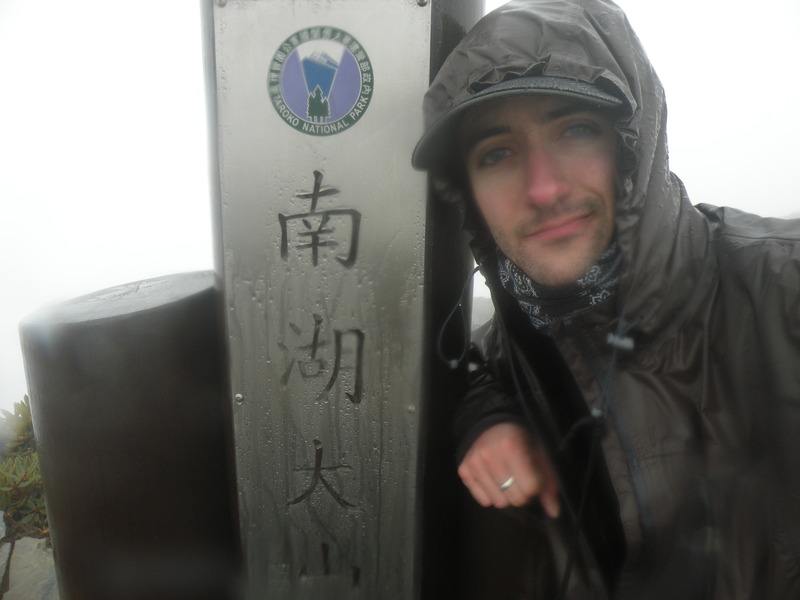 I headed off to the Main Peak of Nanhuda Shan with two friendly Taiwanese hikers whom I met in the cabin. One, a businessman who spoke fluent English, had hiked Nanhuda Shan twice before, and told me that he had never seen such awful weather! The route up to the Main Peak was surreal. The fog was so dense that we could only see a few meters in front of us, and no trail had been broken through the snow. We climbed up to the saddle between the East and Main Peaks, and then went about the business of finding trail markers, still visible despite the snow. The terrain was rocky and desolate. 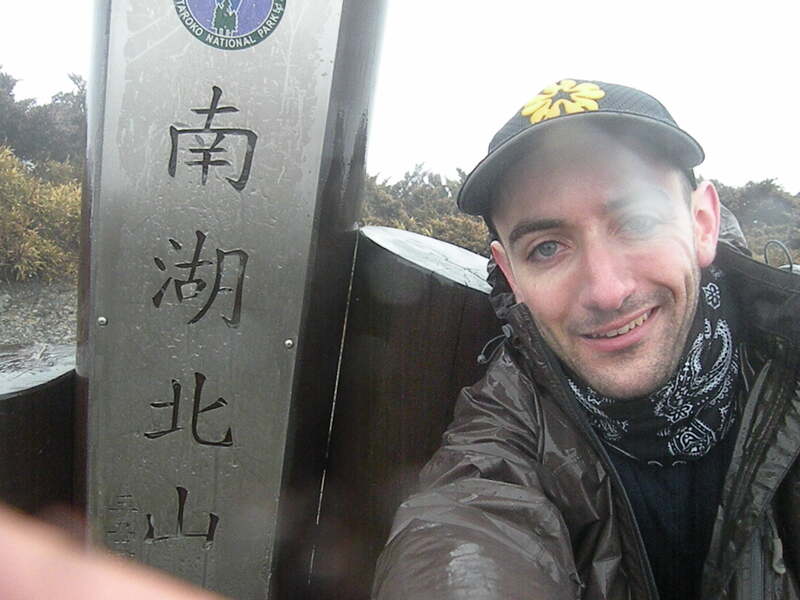 At the Main Peak, soaking wet. Whiteout visibility. Getting back from the Main Peak took us much longer than it would have in decent weather. We got lost a few times, and had to carefully backtrack. Returning to the campsite, I crashed in my tent for a few hours of sleep. When the sun set the temperature dropped, creating mucky fog and sleet. It is hard to imagine worse camping weather. I woke up feeling strong, and decided to take one more trip up the ridge before heading down. My two new friends from the day before descended all the way to the trailhead, deciding to leave early due to the weather. The temperature had dropped, freezing everything. The sleet/rain stopped, but the fog remained. Visibility was poor – I was completely socked in. Retracing our route from the evening before, this time I turned east on the saddle, heading over fields of ice and snow towards the East Peak of Nanhuda Shan. 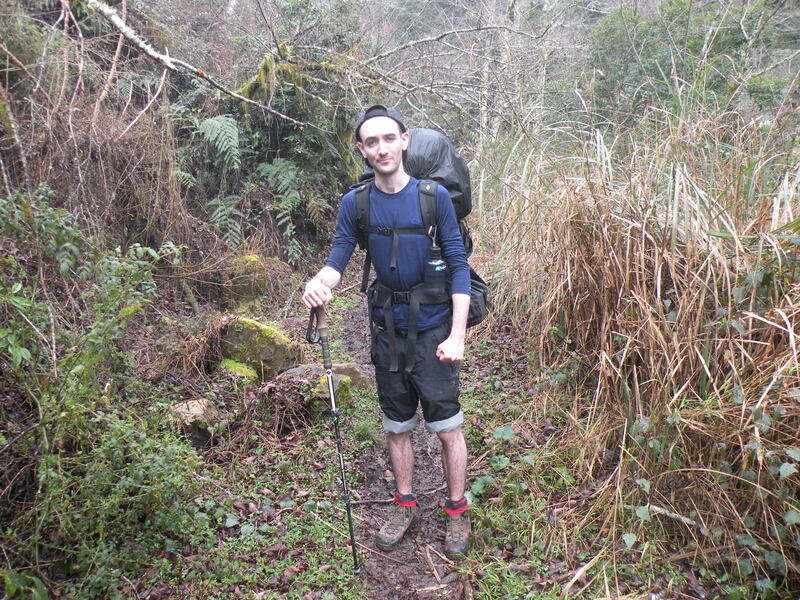 The trail was rough, rocky and almost totally devoid of plant life. I built rock cairns as I went, to protect myself from getting lost in the low visibility fog. The East Peak of Nanhuda Shan. Zero visibility! 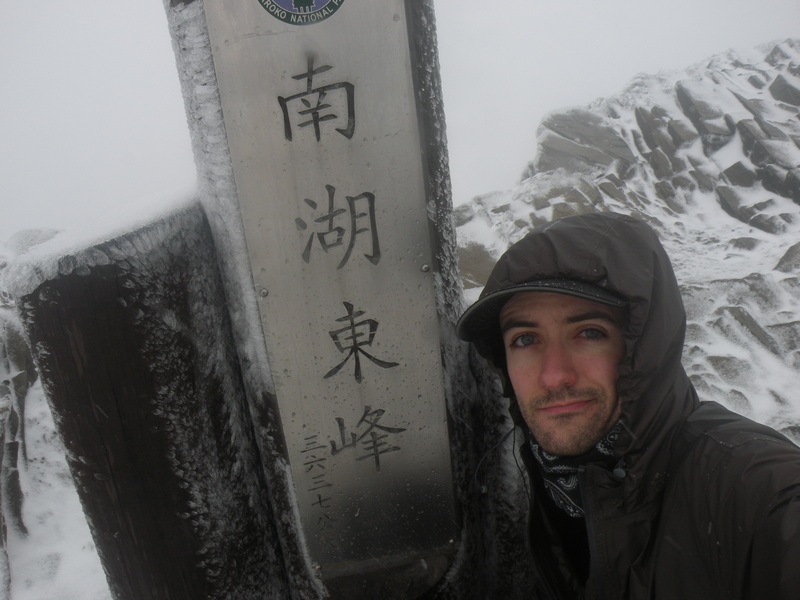 From the East Peak, I returned to the Nanhu cabin. There, I packed up my camping gear, and headed back to the Yunling cabin. It began to rain again. At Yunling, I pitched camp in the rain, cooked a hot dinner inside and went to bed. I slept like a rock; compared to the freezing sleet and saturated humidity of the night before, the rain was pleasant! 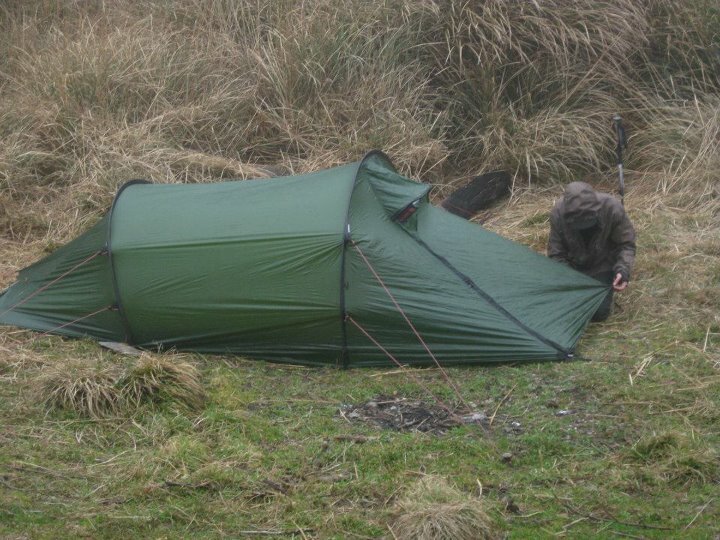 Adjusting my tent pitch, in the rain, on the third evening. Yunling had plenty of space, and I managed a nice comfortable setup. Day 4: I slept in until 7 a.m., packed up, and hiked out to the trailhead. Despite the weather, I thoroughly enjoyed this trip. 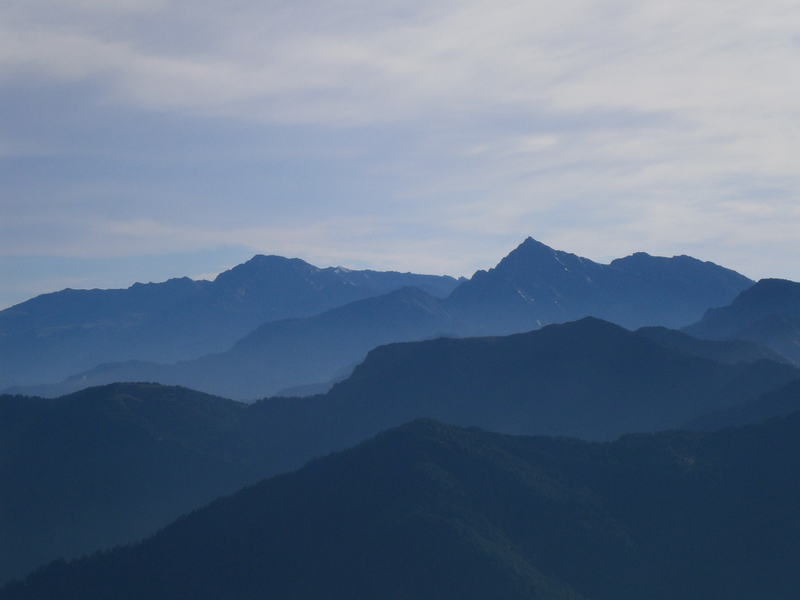 The terrain at Nanhuda Shan is impressive, varied, and exciting higher up. Hopefully I’ll get some views, and some better photographs next time! The Yunling cabin is well built and appeared spacious enough for sleeping. I chose to camp at Yunling, and did so quite comfortably for two nights. The area around Yunling has space for two or three tents. Yunling has a reliable water source. You can book cabin space and camping space during the permit application process. The Nanhu cabin is quite large, and was very comfortable. 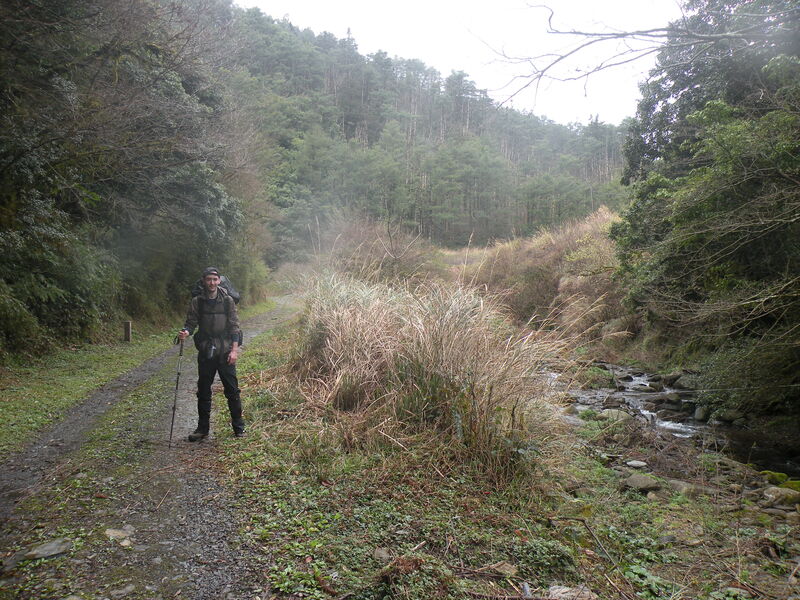 There are numerous spots for camping at the Nanhu cabin, and plenty of space, as well as a reliable water source (a nice stream). Nanhu campsite is above the treeline and very exposed. In the high humidity and freezing rain/sleet I experienced, it was definitely not ideal for camping. There is also a ‘middle’ cabin located between Yunling and Nanhu, the Shenmazhen cabin. The Nanhuda Shan trailhead is fairly easy to access. Take a bus or train to Yilan City or Luodong, and rent a motorbike. A taxi in cost us NT$2500. This entry was posted in Hiking, Taiwan - 台灣, Taroko National Park - 太魯閣國家公園 and tagged Nanhuda Shan, Taiwan Hiking, Taroko National Park, 南湖大山, 太魯閣國家公園 by Ian. Bookmark the permalink.